Hi, I am interested in your 1957 Chevrolet 210 (stock #1713-TPA) listed on Autotrader for $58,995. I'd like to get more information about this vehicle and confirm its availability. Heres the best way to bring Chevy icons together. 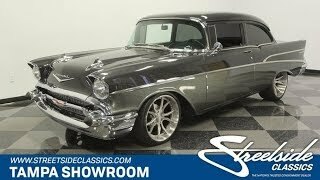 This is a 1957 Chevrolet 210 Restomod on the outside, but underneath the skin, its a fresh build the best modern upgrades you could want, including Corvette-inspired LS1 fuel-injected V8. This one instantly announces its something special. Two-tones were terrific to have on a 57 Chevy, but the presentation is quite modern here. After all, the factory never offered a cool package that utilized Charcoal Gray and Graphite Gray. You can tell there was a small fortune spent here, because theyre modern metallic paints with deep clearcoat finishes. So the sunshine radiates as it evenly rolls across the whole car. These colors are part of a thoughtful package along the same spectrum. In fact, all the brightwork follows the same tone for a fully-coordinated look. This chrome is iconic as it separates the two paint colors along the profile. The wraparound bumpers, legendary 57 grille, and jet-inspired trim all have a mirror-like appearance of a well-prepared classic. And the upgrade to modern alloys really ties together this modern and shining custom package. Just like the exterior, the interior delivers all the right upgrades without losing its vintage appeal. The color theme continues with comfy velour seats, matching door panels, and newer carpeting throughout (including the trunk.) You also might notice that the paint on the dash, door tops, and bright trim give this a similar look to the exterior for a very uniform total presentation. The 57 Chevy dash retains the classic look, but now it has some great driver upgrades, like the newer steering column, black and chrome sports steering wheel, and full modern Dakota Digital gauge package w/tach. And no matter if youve got a carload of family and friends or youre just cruising solo, the modern R134a air condition is a welcomed addition for everyone. The first Tri-Five Chevys were the dawn of the small block, but they were never given anything as powerful or as turn-key as this. Its an LS1 fuel-injected V8 that earned its powerful reputation from the Corvette another great Chevrolet icon. Theres only about 3,000 miles on the whole build, and so everything looks quite fresh. It even includes an engine cover that is color-matched to the exterior two-tone. The shorty headers give this car a throaty exhaust that announces its a powerful and modern machine. In fact, it has all the right upgrades to be a terrific cruiser. This incudes four-wheel disc brakes, power steering, and a four-speed automatic transmission w/highway-friendly overdrive. Theres even a large Griffin aluminum radiator w/electric fans to help keep you running cool even if youre in traffic with the A/C pumping. This is a shining and unique 57 Chevy that has been upgraded to be enjoyed anytime. So if you love driving your icons, all today!